THEN the owner will put 100% of revenue towards efficiency upgrades and increase the certified local producers that supply his store. We are Carrotmob Toronto. We turn the traditional Boy-cott upside down into a "Buy-Cott". 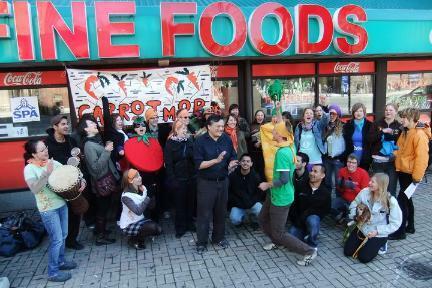 This will be Toronto's first Carrotmob - are you ready? Increased revenue by 48% bringing G's $9,516 Canadian dollars to put towards effiency. 15 additional certified local producers will now be stocked at the grocery store.